The idiosyncratic shapes of the Modern Rococo Collection pay homage to historical forms. 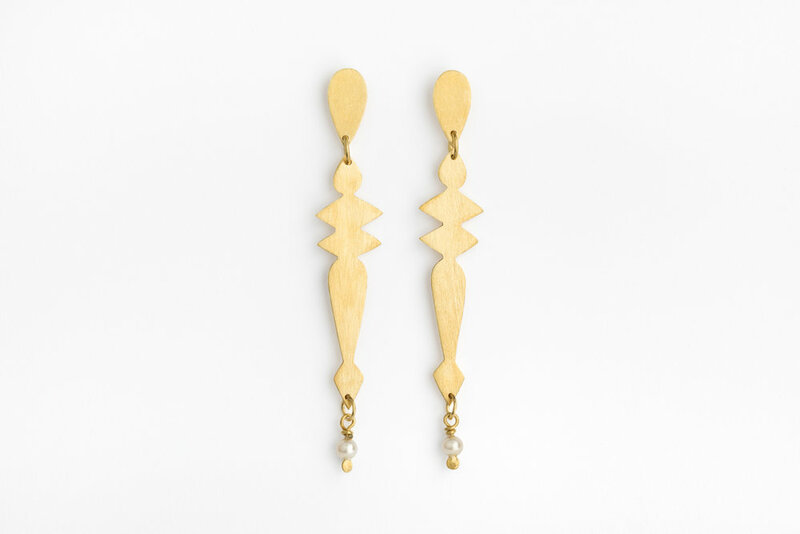 Inspired by medieval architectural detailing, Renaissance jewellery and chess pieces. The overall affect is rather Rococo. Split into 'Finial' shapes and 'Queen' shapes this collection is all about earrings and brooches with just a hint of necklace. Every piece is hand pierced with a jewellers saw giving each one a unique shape and slight quirk of its own. Designed in brass with its strong graphic edge and glorious straw colour this collection is plated in Hatton Garden with a luxurious layer of 22 carat gold. The satin finished pieces perfectly tone in with the vintage pearls they are paired with. Tiny hand beaten ends catch the light and twinkle under each pearl.